John de Lancie – My TV Show Surprise! 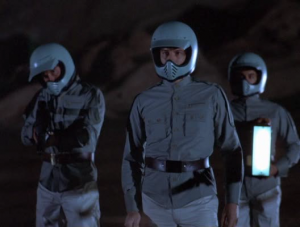 Recently I was watching the original Battlestar Galactica episode “Take the Celestra” (I had to do my homework to see how the new rendition compared to the old version). While working on my laptop between scenes I heard a very recognizable voice that quickly drew my eye to the screen. Looking up I saw a handful of Terran police talking on screen (apparently having just come from an intergalactic BMX tournament of some kind as indicated by their very threatening helmets). The lead officer was clearly John de Lancie as his voice has become one of the more easily identifiable inflections in the geek community. Many of us, like myself, first encountered John in Star Trek: The Next Generation premiere episode “Encounter at Farpoint” as the omnipotent Q. He went on to make many appearances in DS9 and Voyager – and continued on into various other scifi shows. His tone and inflection are so clearly identifiable that he doesn’t even need to use the “Q” voice to be quickly identified. He even recently had a small part in Assassin’s Creed 2: Revelations that I hope will be larger than the 5 minutes of speaking time allowed him in the game. I am always surprised when I see an actor/actress that I think “started” there career where *I* encountered them – but had an entire career before that intersection. Or you remember an actor from a previous “life” who has grown dramatically larger than their origins might have indicated (George Clooney – Facts of Life and Leonardo Dicaprio – Growing Pains or Billy Zane as an 1-line extra in Back to the Future). In our normal lives we rarely get to see the type of rock star growth that can happen in Hollywood and am always excited, encouraged and elated to see that there are instances where talent and hard work prove off. Most people in life have slow trajectory growth and movies/television have a way of taking someone from nothing to something in a short time. Music can do this as well but rarely do the musicians grow, evolve, expand their career the way most actors/actresses tend to do. While it is still all acting, the choices that they make with their career are very deliberate – usually much more so than our own meandering and easily anticipated step-after-step lives. There are those last few who go even further to move out of acting and into producing (Ron Howard, Tom Hanks, Clint Eastwood, George Clooney) and we’re exposed to yet another amazing career jump. I can take a lot of inspiration from these types of individuals.